Crowd around the fire pit and make big plans for tomorrow. The mountain views have a way of doing that to you. Settle into one of the English roll-arm chairs in the lobby, book or tablet in one hand, adult beverage in the other. Cushy chairs and cozy fireplace make it nearly impossible to talk yourself into doing anything productive. Suddenly you're wishing you were a little more skilled in the culinary arts department. It's an easy walk (even in ski boots) to the Centennial Express Lift. Ski-in/ski-out access means more time hitting the slopes vs riding the shuttles. You're a 6 minute walk to downtown Beaver Creek. Ask the concierge for local favorites. European-style charm abounds, complete with poolside fireplace. Find your way to the posh spa, and make a day of it. Gather your crew in one of the outdoor hot tubs and see if you can spot any constellations. Calling all hikers. The Beaver Lake Trail is just over a half-mile away. The Beaver Creek Golf Club is adjacent – it doesn't get more convenient than that. 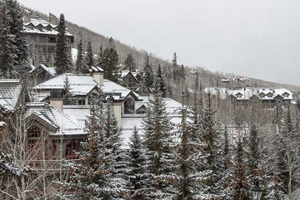 Named among the Top 50 Ski Hotels in the U.S. and Canada by Conde Nast, The Charter is a ski-in/ski-out European-inspired gem, walking distance to Beaver Creek Village. Two different shuttles make the ski lift and town loops as well. The mountain is obviously the main attraction and your primary reason for making the trek out here. That said, the kids may find the pools, indoor and outdoor hot tubs and game room equally fun (well, almost – it’s hard to compete with a mountain). While they battle it out over foosball, air hockey, Wii and arcade games, make your escape to the 18,000 square foot spa and health club. It’s indulgence, pure and simple – no twinges of guilt allowed. On your way back to check on your crew, stop by the pool snack bar and pick up s’mores kits for later around the fire pit. Showing up with a few of those will catapult you to a whole new level of Best Mom Ever-ness. Get your skiers and riders (or summer bikers) set up with gear from Charter Sports (right onsite), and drop it all back with the ski valet before heading to après somewhere festive. Should you choose to opt out of dinner duty, the Black Diamond Bistro is happy to pinch in. And if you don’t exactly have a plan yet for breakfast in the morning, The Terrace restaurant at the base of the grand staircase puts on a good show, with patio seating during the warmer summer months. Classic mountain lodge-inspired one- to four-bedroom condominiums are exquisitely furnished, from the western-themed light fixtures to log-frame chairs. (Mountain views are the icing on the proverbial cake.) Your private patio or balcony is après ski HQ, and even better in the summer, when you don’t have to leave your hat or gaiter on. Stunning full kitchens inspire even the not-normally-all-that-culinarily-inclined to go all-out with dinner. (Chronic overachievers who have their lists ready in advance can get groceries delivered.) Evening entertainment may be as simple as a rental from the onsite DVD kiosk, or a few hands of Euchre (quick, someone Google the rules). Leave your car tucked away in the complimentary underground parking, and leave it to the local shuttles to get you around. Or rent bikes from the sports shop downstairs, pack lunches and see where the paths take you. The concierge is your connection to the best of Beaver Creek – don’t miss out. Summer brings everything from rodeos and outdoor yoga, to the annual Beaver Creek Art Festival and movies under the stars. Winter highlights include the traditional New Year’s Eve Torchlight Ski Down (with music and fireworks), Winter Culinary Weekend, and Helmut Fricker, Beaver Creek’s alpenhorn-blowing, lederhosen-clad, accordion-playing mascot in the Village Plaza all winter (since 1980!). The property is closed between 10 April and 28 June, 2019.